The Southern Coalition for Social Justice, American Civil Liberties Union, and ACLU of North Carolina Legal Foundation today filed a lawsuit challenging North Carolina’s voter suppression law signed by Gov. Pat McCrory. The suit specifically targets provisions of the law that eliminate a week of early voting, end same-day registration, and prohibit “out-of-precinct” voting. 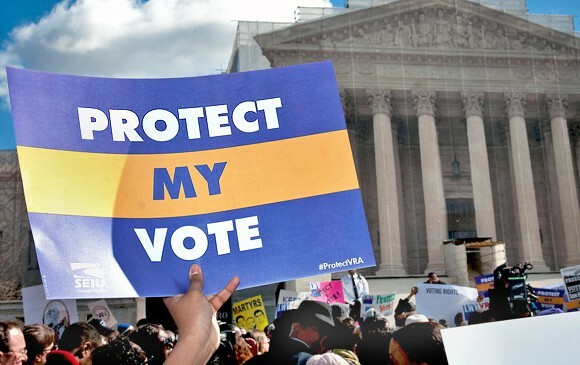 It seeks to stop North Carolina from enacting these provisions, arguing that they would unduly burden the right to vote and discriminate against African-American voters, in violation of the U.S. Constitution’s equal protection clause and the Voting Rights Act of 1965. The lawsuit was filed on behalf of several North Carolinians who will face substantial hardship under the law, and on behalf of the League of Women Voters of North Carolina, the North Carolina A. Philip Randolph Institute, North Carolina Common Cause, and Unifour Onestop Collaborative, whose efforts to promote voter participation in future elections will be severely hampered if the measure takes effect. North Carolinians use early voting in vast numbers. During the 2012 election, 2.5 million ballots were cast during the early voting period, representing more than half the total electorate. More than 70 percent of African-American voters utilized early voting during the 2008 and 2012 general elections. For many voters, the choice is between early voting or not voting at all. Early voting provides flexibility in finding time to vote, and significantly eases the burden of arranging transportation to a voting site. This is particularly critical for low-income voters, who are more likely to have hourly-wage jobs that don’t afford them the time to get to the polls on Election Day or during common work hours. Work, combined with child-care responsibilities, places great demands on voters living in poverty. Poverty in North Carolina is higher among African Americans, meaning a reduction in early voting opportunities will disproportionately impact voters of color. Eliminating same-day registration and out-of- precinct voting also imposes hardship and silences the people’s voice. In recent elections, North Carolinians could register, or update their registration information and vote, in one trip to an early voting site. In both 2008 and 2012, approximately 250,000 people did so. African Americans disproportionately relied on same-day registration in both elections. The new law eliminates this opportunity to register, effectively disenfranchising tens of thousands. As for out-of precinct voting, for over a decade voters who accidentally cast a ballot in the wrong precinct could still expect to have their votes counted for races such as governor and president. If this law takes effect, those votes would be void. The case, League of Women Voters of North Carolina et al. v. North Carolina, was filed in the U.S. District Court for the Middle District of North Carolina. Read SCSJ’s NC federal voter suppression suit summary here. Read the full complaint here: Early Voting Complaint. The NC NAACP filed a separate suit on these and other voting rights issues today.